So I know it’s been awhile since my last post, but it’s been incredibly busy over here, with us having just returned from our last expedition. There’s so much that’s happened that I’ve chosen to split it up into multiple posts in order to give the places the attention that they deserve. 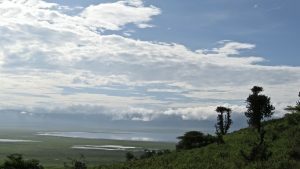 We went to the Ngorongoro Crater the other day, and in case you’ve never heard of it, I’ll give you an extremely brief overview. The Ngorongoro Crater is both a wildlife conservation area and a world heritage site, since it’s theorized by many scientists that the first humans originate there. Some refer to it as the “cradle of mankind.” Now, though, it’s a protected area that provides a unique environment for the wildlife inside of it. Though the animals have the ability to come and go from the crater, some species do not like the climb and so their populations remain in the crater. 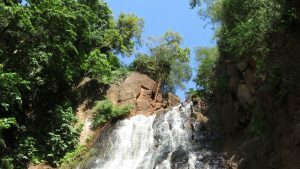 Surrounding it are semi-preserved areas and farming/pastoralism. 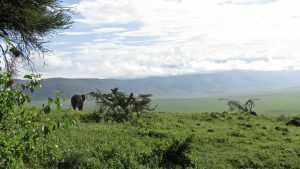 Most of the people living around the Crater are Maasai who herd their cattle and other animals on the wide expanses of grassy hills there. On our way in, we passed about 20 school children in uniform on their way to school, and I couldn’t believe that they got to go to school in such close proximity to the Crater. Though I’ll add some pictures of the Crater to this post, they will not do justice to the view of the area from the rim. 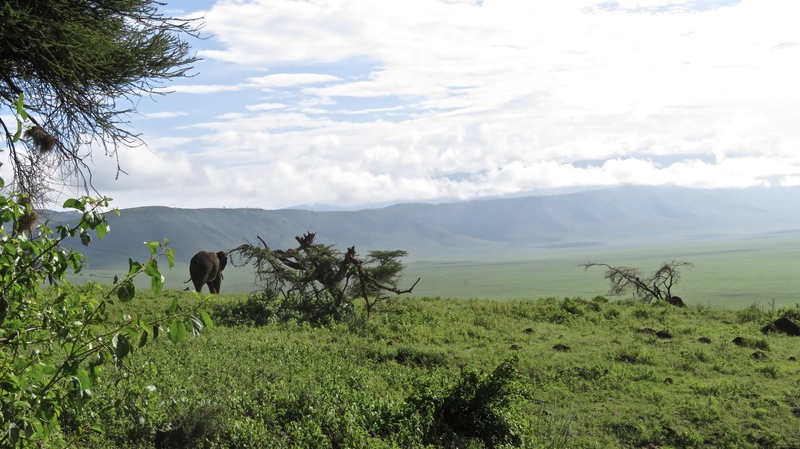 I’ve been lucky enough to see a lot of beautiful things in my life, but the Ngorongoro Crater instigated the strongest response in me that anything I’ve seen has. Inside the Crater, we also saw 5 rhinos, including a baby (see later for my incredibly blurry far-away photos). 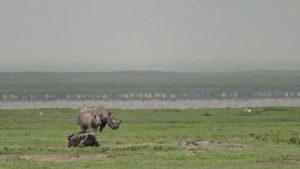 There are so few left in this area that you can only really see them in the Crater and in the Serengeti. The fact that I got to see them in real life is absolutely incredible, and I continue to be in disbelief that this is my life right now. Though it’s been difficult getting past homesickness and adjusting to a very different lifestyle to my usual, the struggles have been well worth it even if just for the Crater. Hope you enjoy the pictures, and there are more to come! 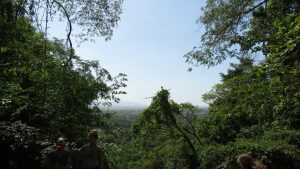 The view from the rim of the Crater at the entrance to the park. The fog was rolling up the hill like in a fairytale. An elephant looking out onto the crater. The view of the pond/lake in the middle of the Crater. Since it’s the rainy season here, it was quite full. 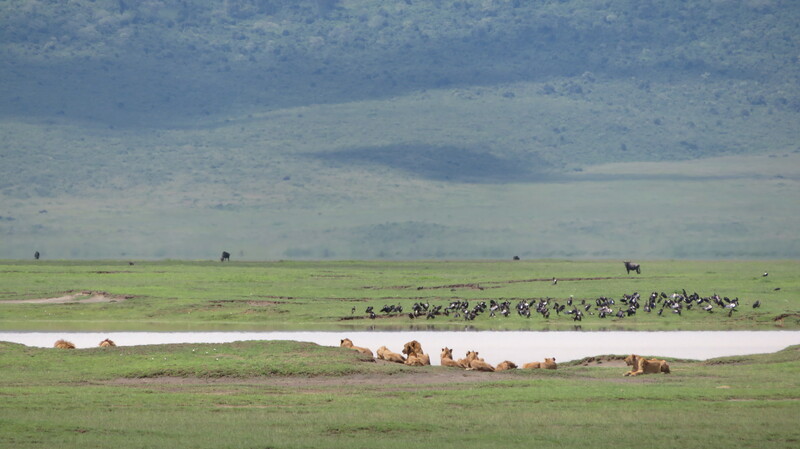 A very large pack of lions chillin by the water…they later had a bit of a territory dispute with some cape buffalo. 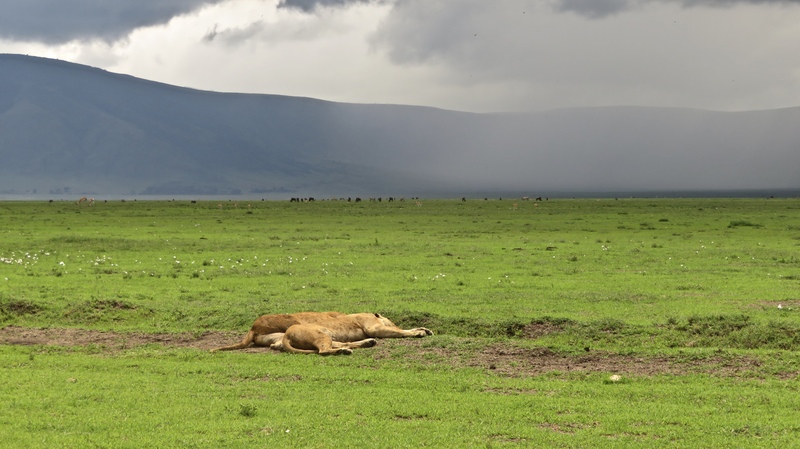 Some lions taking a cat nap in the sun as a storm formed in the background. An extraordinarily blurry photo of a mama and baby rhino. 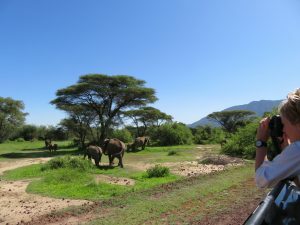 Of course I’m writing one of these posts about elephants; though the prolific animal already receives so much attention, I can’t help but feel the need to write about my experience being so close to them in this past week. 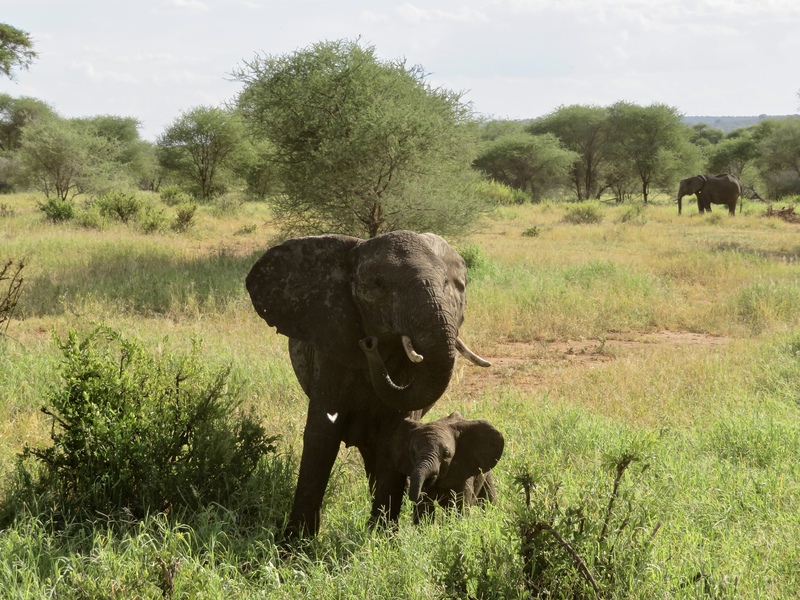 Before leaving for our expedition to camp outside of Tarangire National Park, we watched a movie on Netflix called The Ivory Game, and I recommend anyone interested in the issue of ivory poaching in Africa give it a view (though, to be warned, it is terribly sad to watch). For a slight, surely botched overview, African elephants are regionally extinct in Northern Africa, with their numbers being very low in West Africa, and most healthy in East Africa as of now. 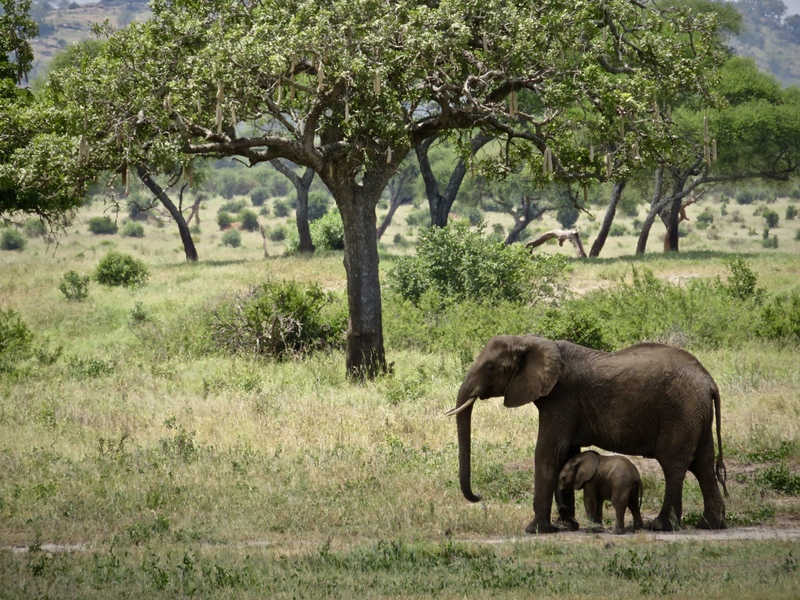 Unfortunately, despite government efforts to conserve the species in countries like Tanzania, Kenya, and Uganda, poaching of elephants has been a continuous issue in the region. 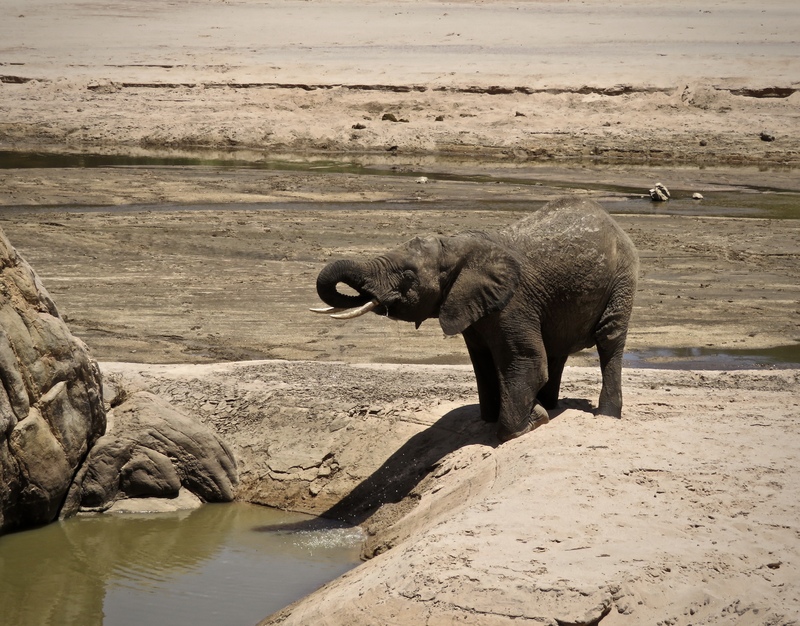 Approximately one elephant every 15 minutes is killed for its ivory. The brave people who work as rangers and soldiers to protect these animals consistently put their lives on the line, a job that sometimes turns fatal as some big-game poachers don’t always restrict their fire to the elephants. 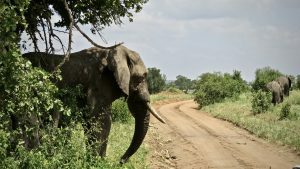 I know it’s a bit depressing to read about human’s hunting of elephants just for the sake of their tusks, but it was really important to have an understanding of how big a blow we as a species have made to elephant populations before spending hours watching and admiring them in the field. At one point, while waiting in our car watching a big 30-elephant family graze in the bushes, a huge male elephant—easily double the size of any of the others in the group—came out from behind a tree and walked across the dirt road. 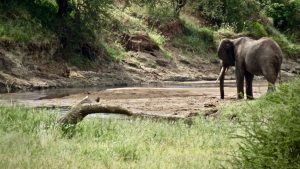 The sheer weight of his steps shook the ground, and even our professor who has hours and hours of field experience with elephants was shocked that we saw such a large male so close. Though it was incredible to see, we all commented how sad it was to know that his size and beauty put a big target on his back. 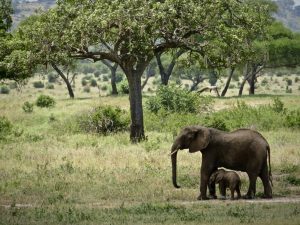 Elephant poaching in Tarangire isn’t a huge issue in comparison to other parks, luckily, but that by no means ensures these elephants safety. On a lighter note, we passed countless groups of more than 50 elephants grazing, playing in the water, playing with each other, and nursing and it was absolutely incredible. Apparently, we’re here at perfect timing for calving season so I’ve seen at least 100 baby elephants and oh boy are they cute. We watched one struggle for at least 2 minutes to get up off the ground and it was precious. The elephants often huddle in groups around the babies so as to protect them from predators, so seeing the babies out front was real special. We also saw a pack of about six lions try to hunt some of the babies, and as soon as the biggest female charged them and roared, they jumped out from under the cover of thick grass and ran away. I felt like I was in the middle of an episode of Planet Earth, it was amazing. In case you were too lazy to read, my weekend was full of observing elephants, and I easily saw more than 500 in a matter of just a couple days. I feel so incredibly grateful to be studying these amazing animals, and still cannot believe that I had a graded school assignment to watch and write about them. 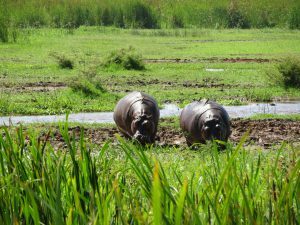 Not to cheese too much, but life can be really incredible sometimes and our expeditions through Tarangire surely reminded me of that. As I go to school here, I am learning how to speak Swahili (it’s going slow but that’s what I expected). So as long as I’m learning, I’ll share some here. Sorry that was a bit long, but here are a bunch of photos of the elephants I met this weekend. A mother and baby walking side-by-side. The mother was very protective, always alert of any dangers. 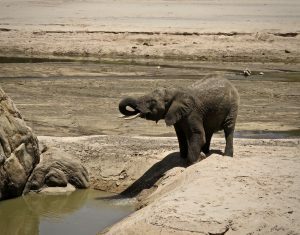 A mother elephant hydrating under the very hot sun. This little baby was checking us out making sure we didn’t smell too sketchy. We caught the sad sight of a lion eating the carcass of a baby elephant just before this. All the elephants were on high alert and this one had a stand-off with a lion from the same pack. This is the huge male elephant we saw. Though he may not look too big in this picture, he was by far the largest elephant I have seen so far. A very protective mother not too pleased with the humans looking at her baby. It was very hot out and we were all very jealous of these elephants. 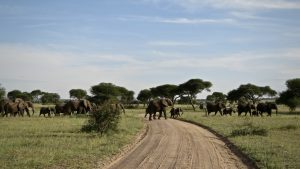 Just as we were leaving the park, this group of elephants crossed the road right in front of us and it was absolutely spectacular to watch. 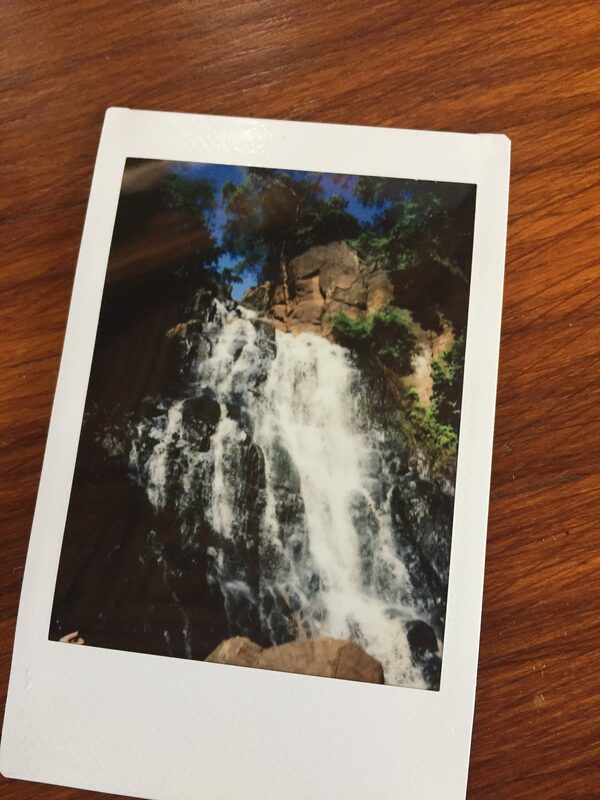 Alright y’all, just as a warning, this post will certainly not be as fun as my last post, but if you read to the end I’m posting some amazing photos I took from the top of a waterfall we hiked to the top of last weekend. They’re worth it, trust me; the top of this hike revealed one of the most incredible views I have ever been so lucky to see. Back to the real news, though, I got sick this week. Since I don’t personally know everyone who is reading this blog, I’d rather not get into detail about what all my body was experiencing, but I can assure you it has been thoroughly unpleasant. My illness came to a peak a couple of days ago in my Swahili class, in a rather unfortunate way as well. My Swahili instructor, Frank, went up to me at the beginning of class and asked me in Swahili where I was from. I, having been too sick to review my Swahili, had no clue what to say, and as I struggled to figure out what to say in response started to feel horribly sick. Once he moved onto the next student, I left class to lay down and give myself some time to rest and try to forget about how sick I felt. I find, in general, that it is very easy to focus on the negative when I feel sick. As I was laying in my bed, staring up at my mosquito net, I definitely started to have some more doubts about having decided to commit the next three months of my life to this program. Like, crap, what have I done? I started to worry that my only association with Tanzania would be with constantly feeling weak and sick. To be fair, the elevation here is quite a bit higher than at home, so even just running around in soccer felt like running a freaking mile. But I think the hardest part about being sick is watching everyone else on the program having a good time, enjoying the activities, buying beautiful fabrics at local markets, and playing sports with people who live in the village our camp is in. I felt like I was missing out on such a crucial time to experience Rhotia and get to know the other students and staff in the program. Finally, I gave in and asked to be taken to the local clinic. And holy crap, the clinic nearby is so nice! I wish it was my normal hospital at home (no hate, Dean). The outside was beautifully landscaped, full of flowers and colorful ramps and staircases. Apparently, there are some really cute dogs there? (I didn’t get to see them). They saw me way quicker than my doctor at home—without an appointment—and the whole clinic was super well organized. To top it off, with the visit and prescriptions together, I only had to spend $15. I’m only describing these details so much because I think there are a lot of generalizations and stereotypes about the “country of Africa,” that invade the minds of Americans when we think of any African country. I’m also describing this because it’s whack how expensive medical care is in the U.S. According to my Student Affairs Managers, it costs less to fly to Tanzania, give birth to a baby, then fly back to the U.S. than it does to have a baby at a local hospital in America. Well, that’s my sickness rant. In case you’re wondering, I’m feeling much better and have a substantially more positive outlook on the rest of the program now. Word for the wise—look up where nearby hospitals are when traveling; you never know when you’ll need to go. Asante (thank you) for reading my words. Here are those pictures I promised. 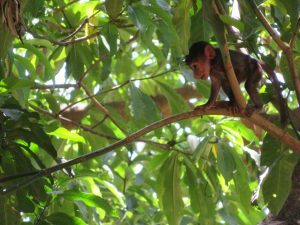 A baby baboon learning how to climb trees. His older brother constantly pulling on his tail didn’t help very much. Renee practicing her wildlife photography skills. This was just a tiny fraction of the huge herd we were in the middle of. 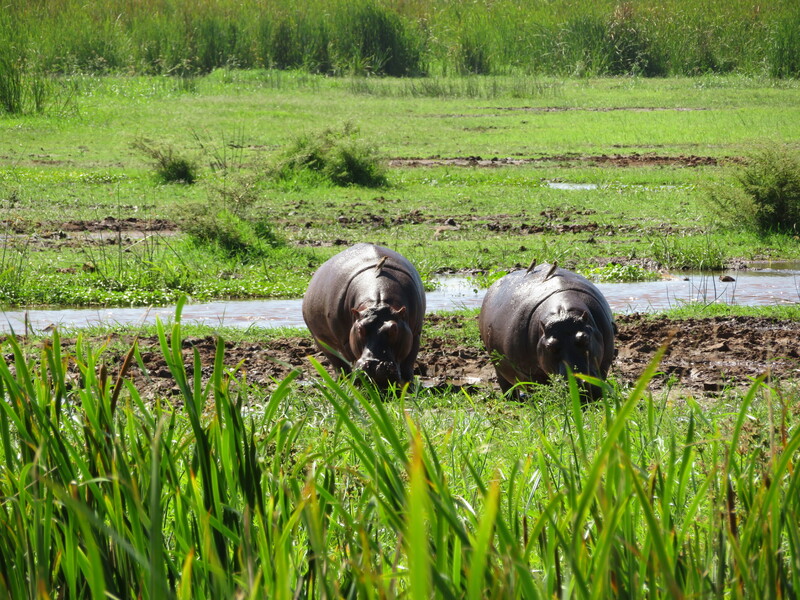 Some hippos soaking up the hot sun. There were about 10 or 20 in the pond right next to them. 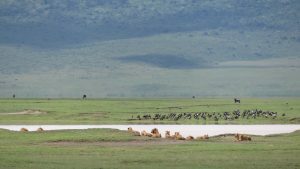 Yesterday, our group drove out to Lake Manyara National Park, about 45 minutes from our camp on Moyo Hill, and wow there are no words that could give it justice. When we first entered the park, while waiting to be let in a group of us went to use the bathrooms. Within feet of us, there was a family of baboons that crossed the road. From the trees near the entrance, we could hear scuffles and occasionally see a baboon pop out of the foliage. I thought I was amazed by how close the baboons were there, but that was nothing compared to entering the park itself. The way the park works is that most visitors enter in bulky truck-like safari vehicles driven by a guide. I have never seen so many binoculars in my life. Once we entered the park, we started our assignment to do scans every 5 minutes for two hours of groups of baboons. Though this should have taken two hours, baboons like to move around sometimes, and almost as if sensing us watching, they often left soon after we began our observations. I’m not going to lie, we all got a little burnt out of the last group of baboons we watched. It was hot and sunny out, and we were very ready to move on. On our way to our lunch spot, we encountered our first group of elephants. They acted as if we weren’t even there! One of the female elephants came within about 2 feet of our vehicle, so close that we could feel her steps shake the ground beneath us, and so close that when she dusted herself some of it flew into our faces. Being one of those children growing up who is in love with elephants (and one of those adults who still is), this experience was absolutely incredible. Once we got to the picnic spot—a lookout with a bunch of picnic tables where most tourists there went to eat—there was another elephant rustling in the branches behind us. At that point I wasn’t even that excited because in comparison it didn’t seem like that big a deal. I still can’t believe I’ve ever had that thought. After lunch was when the real fun began. 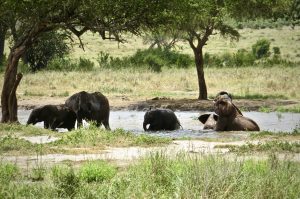 Though we did spend some time watching a group of hippos and we spotted some warthogs, zebras, giraffes, ostriches, and more, we spent most of the afternoon with even more elephants. 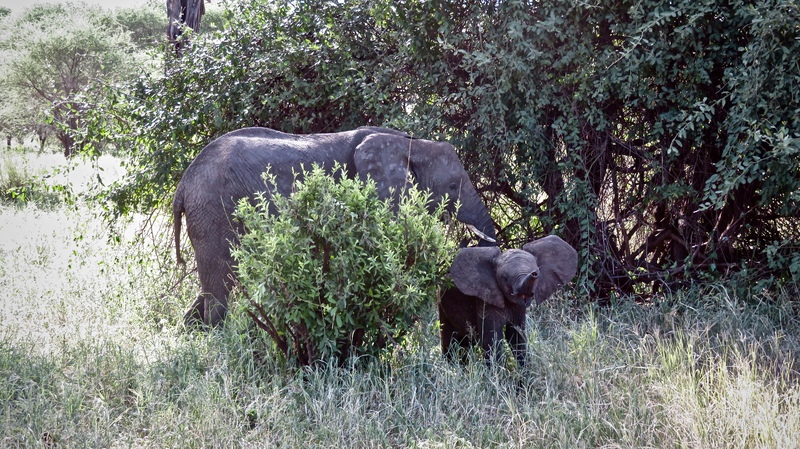 The woman driving our car, Becky (also one of the Student Affairs Managers here), noticed the smallest of rustles coming from the bushes on the side, and within minutes, out emerged three elephants. We were happy to just see these three, but before we knew it, we were amongst a herd of at least 40 elephants. I heard an elephant’s trumpet in real life! Fun fact, the primary noise used to create the sound of tie fighters in Star Wars is an elephant’s trumpet. They mixed it with a bunch of other noises, but if you listen for it, you can hear the elephant come through. It took us some time to realize that the elephants were trumpeting at us, and as we were leaving the area but pausing, we could see some rustling come from the bushes, and just as we were driving off, a very pissed-off looking elephant came running through the leaves. I didn’t believe that elephants could run as fast as people said they could, but boy they can book it. Alright, I’m going to post this before the wifi goes out on our compound again, but hope that was exciting enough for all of you. 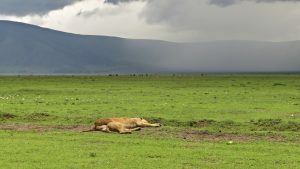 I know it sounds like a ridiculous suggestion, but if you ever find yourself in Tanzania, Lake Manyara National Park is absolutely worth your time. So I made it to Tanzania and managed to lose no luggage and only a little bit of spirit in the approximately 26 hours it took for me to travel here. Though I’ve been enjoying myself so far, I’ve never felt so out of my element in any of the activities or travels I’ve done before this. To get here, I took a flight to the Schipol (sorry if that’s spelled wrong, my internet is too slow to make it worth looking up) airport in Amsterdam, then a connecting 8-hour flight to the Kilimanjaro Airport in Tanzania, about an hour outside of a northern city called Arusha. While in Amsterdam, there were definitely some moments I just thought, “I should get off here, what am I really doing signing up to live on a compound with rugged conditions surrounded by a region full of animals trying to kill me?” To be fair, I think it’s a rational way of summarizing my living situation. I have found, though, that most of my least favorite decisions were ones I made out of fear, so I boarded the plane with a big group of randos also on my program, and here I am. My first full day here (Tuesday), I definitely started to wonder what the heck I had gotten myself into. If you know me at all, you know how much of a NARP (Non-Athletic Regular Person) I am, and I can tell ya there aren’t many of my kind here. We live in little round buildings called bandas here, and yesterday I walked into my banda to hear my roommates discussing the last races they’d run in. Though I have major respect for people who run often, it can be a bit intimidating when you realize how much more physically powerful the people around you are than you. All is good though, maybe this will have a positive impact on my lifestyle habits. 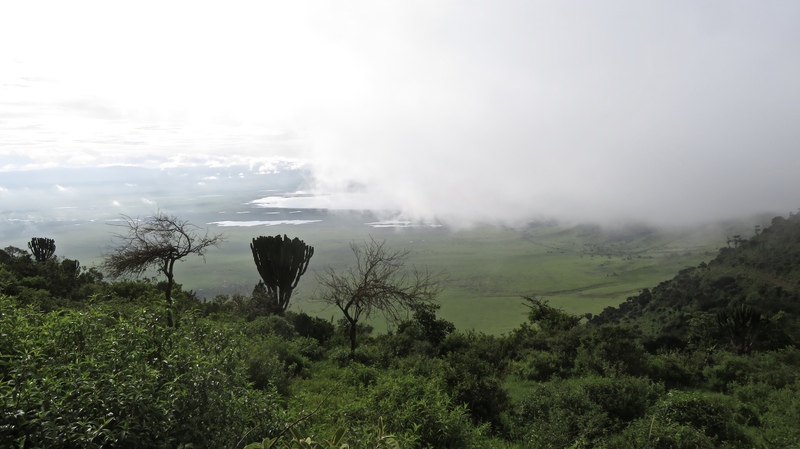 Tanzania (or the distance I have seen on the road between Arusha and Rhotia) is so beautiful. Watching the landscape rush by through the window of our truck, I couldn’t believe that I was actually here. Though we have the Blues in Walla Walla, the mountains here are like nothing I’ve ever seen before. We passed the beautiful Mount Maru on our drive to the camp, and all you could see was the outline of a peak coming through the morning fog. We also passed Lake Manyara National Park, where we will be doing our first expedition this Saturday. Apparently, the baboons we could see on the side of road are major pests here, and quite the kleptomaniacs as well. The Moyo Hill Camp where we’re staying is a closed-in compound right outside of the small village of Rhotia. We took a tour of the town and it was absolutely gorgeous. The soil here is a bright red color, so even large patches of roads and paths where there’s no vegetation are vibrant and colorful. When our group of students walked through the town at first, the local school had just let out, and all of these little children in school uniforms giggled at our surely strange-looking appearance. They were all very excited to meet us, though, which was comforting given how out of place we all looked. On my last note, the fruit here tastes worlds better than the same fruit in America. I’m already afraid to go back to the United States and eat bananas there again, because their Tanzanian counterparts are so much better. They’re so sweet and flavorful it’s incredible. I almost choked on the pineapple I ate the other day because it was so juicy, and even though I usually don’t like watermelon, I have to say I loved the stuff they served us. Fun fact, bananas are one of the most widely-grown crops in Tanzania. You can throw that out if it ever comes onto Jeopardy, so you’re welcome. Oh also, there are geckos in my closet and that’s fun. I’m gonna go for now, but surely there will be more to post in the coming days. Hope all is going well over there, enjoy the winter, suckers. Welcome to your brand new blog at Whitman College Sites. For assistance, visit the Edublogs support site, or check out the Edublogs User Guide guide.